My company’s headquarters are located in Southern France, so occasionally, I can be asked to head to Europe for business. This happened last December. 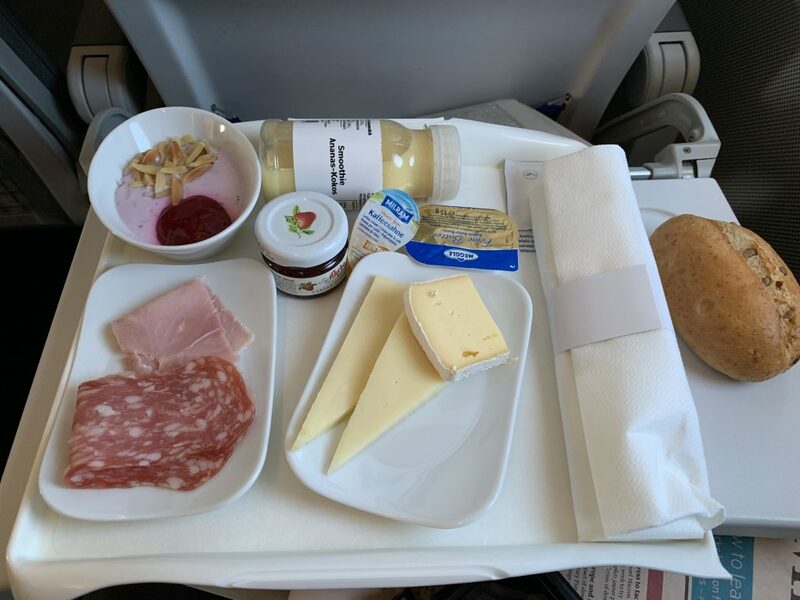 It was the occasion of both sampling the business class of Lufthansa (and its Boeing 747), and, at the same time, of admiring once again, the beautiful city of Nice during this business trip to France. The 4-reactor jumbo jet is much less in favor nowadays, as airways do prefer more economical bi-reactors, such as the Boeing 777 or the Airbus A350. 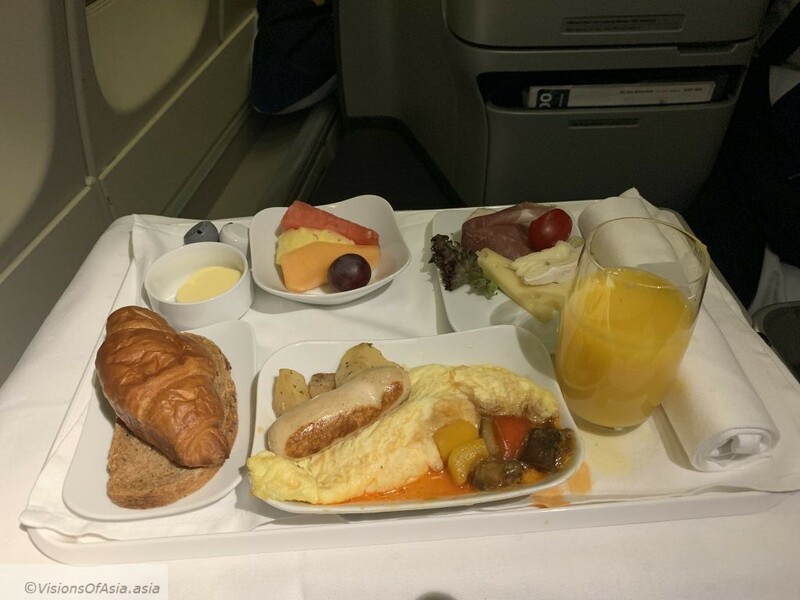 I flew extensively on the B777, and sampled the A350 thanks to Finnair. The B747-8 of Lufthansa, although it has the pretension of being one of the latest models, still suffers a lot of its age. Indeed, on the upper deck (admittedly, the most private setting for the business class), window side seats are established with a two-row setting. This means that if you are sitting near the window, then you have to jump over your neighbor to go to the restroom. In my case, pretty delicate as there is no place to hold yourself when the seat is reclined and this bed is fully flat. 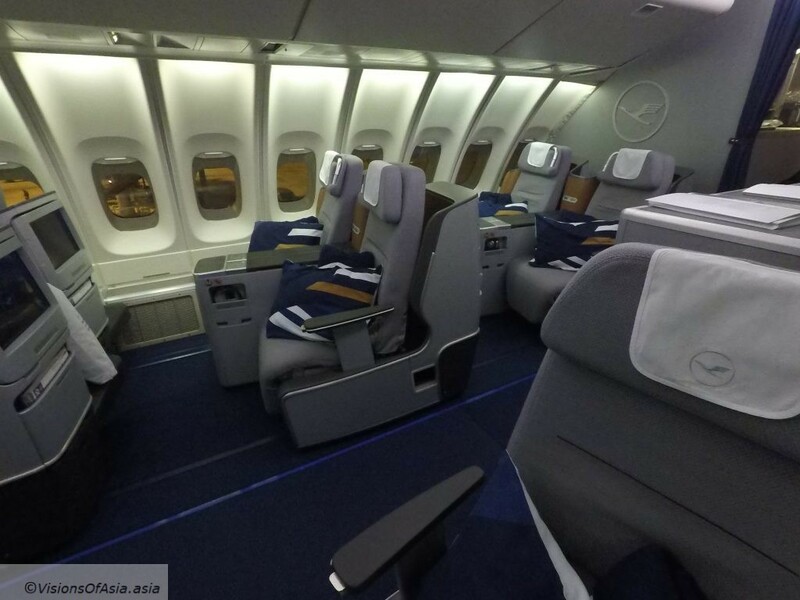 Business class seating on Lufthansa’s 747-8. The 747-8 has one of the latest screens, but managing to connect the noise-cancelling headphones can be difficult. I even had to ask the assistance of the cabin crew to find the connecting port. Beyond that, the movies choice is pretty updated, but of course, when you download, you are necessarily a bit frustrated by the offer. 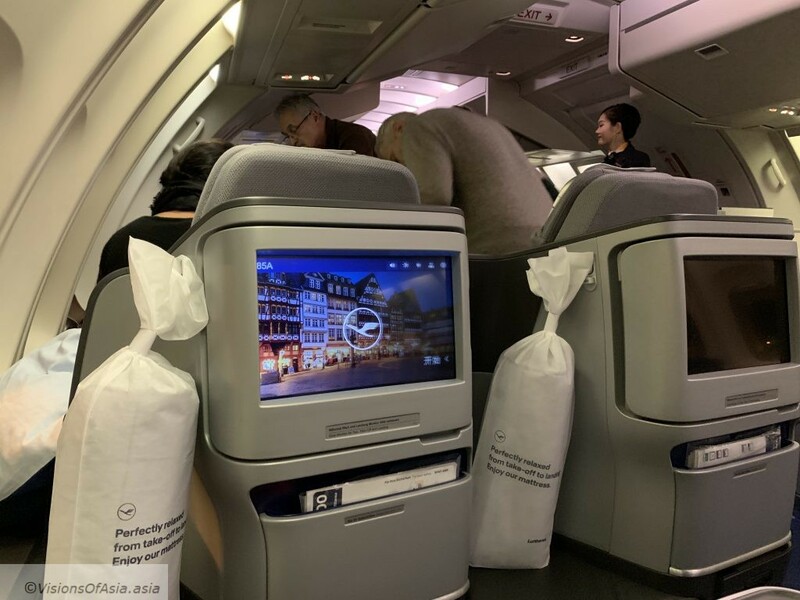 One of the more quirky sides of Lufthansa, is that they provide you a mattrass to be deployed on your seat when you want to sleep. Funny and not necessarily very convenient. 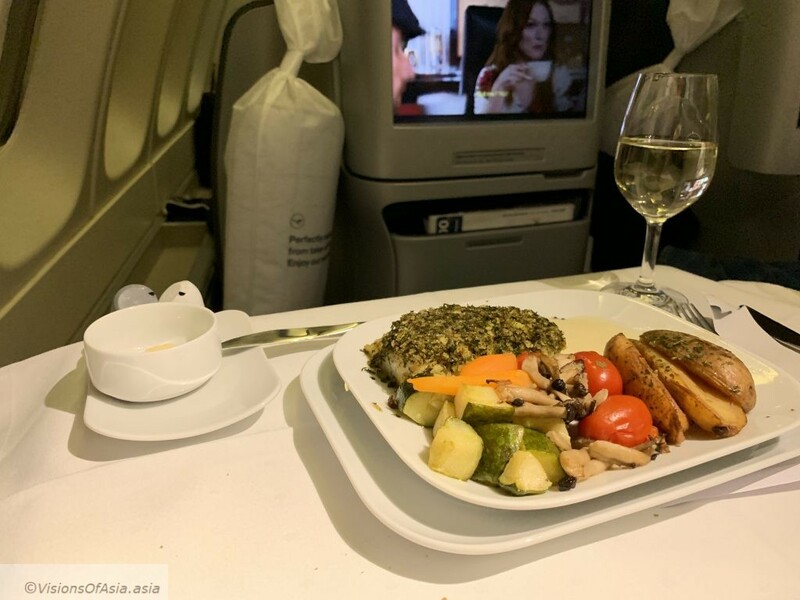 Most people like business class for the food. I have to confess I have a low interest for food, except that I can tell choices are uninspiring. You might call my choice very “German”, as it comes complete with the potatoes! At any rate, it was sufficient to nurrish me and keep me satiated until arrival. One hour before arrival, we were served breakfast. 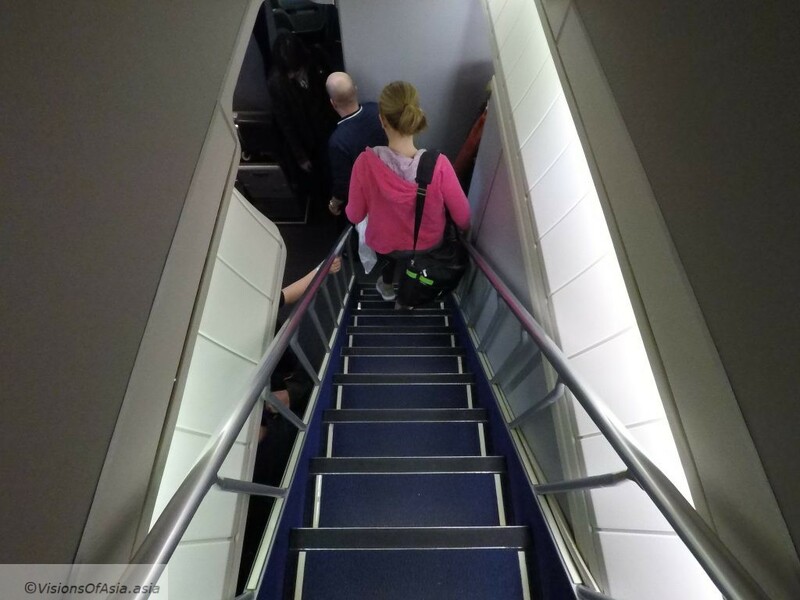 Although the beds are lie-flat beds, I am afraid my back does not allow me to sleep comfortably in the rather Spartan airline seats. Breakfast was a welcome awakening. Once again, it looks VERY German, complete with saussages and eggs. 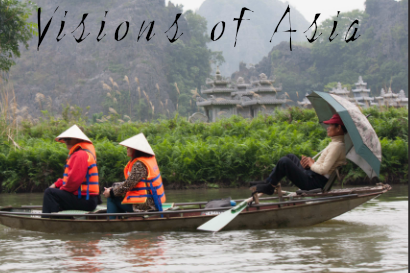 Of course, when flying from Asia to Europe, you are always bound to arrive at dawn. 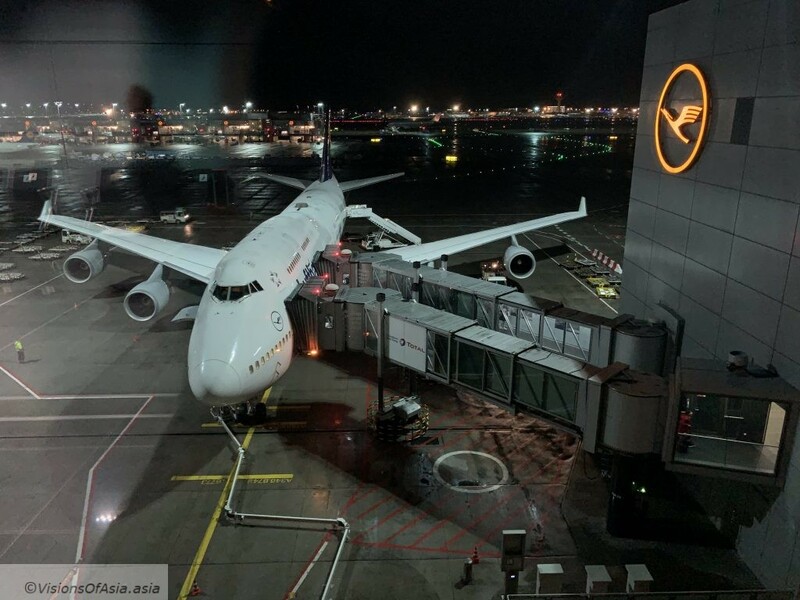 It was not yet 6 AM, and hence quite dark outside as we landed in Frankfurt after an uneventful flight. 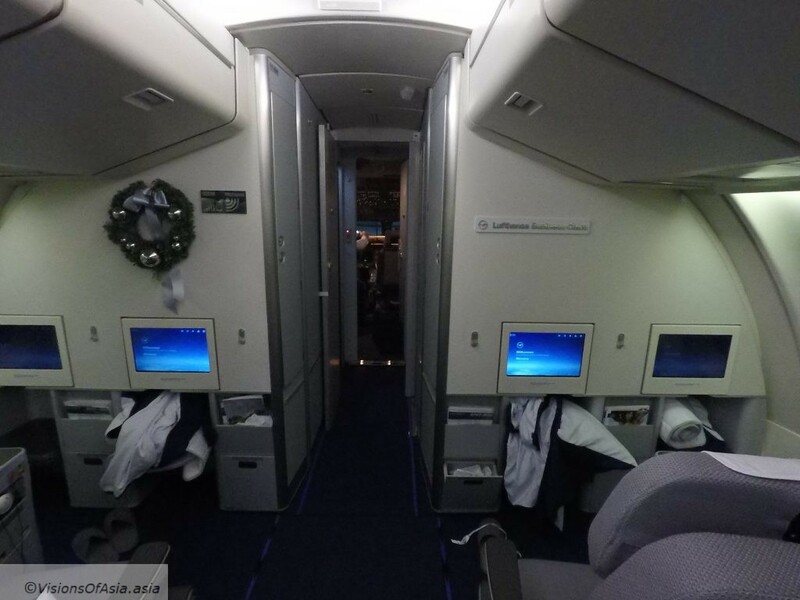 I managed to take a few shots of the cabin and the Christmas decorations on the upper deck, before deplaning. You really get a measure of the majestic plane once outside. In the night, the 747 has still a majestic and royal presence which fills the whole berth. Unfortunately, being a hub for Lufthansa, Frankfurt’s business lounge gets quite crowded in the morning. And, of course, there is a quite a queue to use the lounge’s showers. 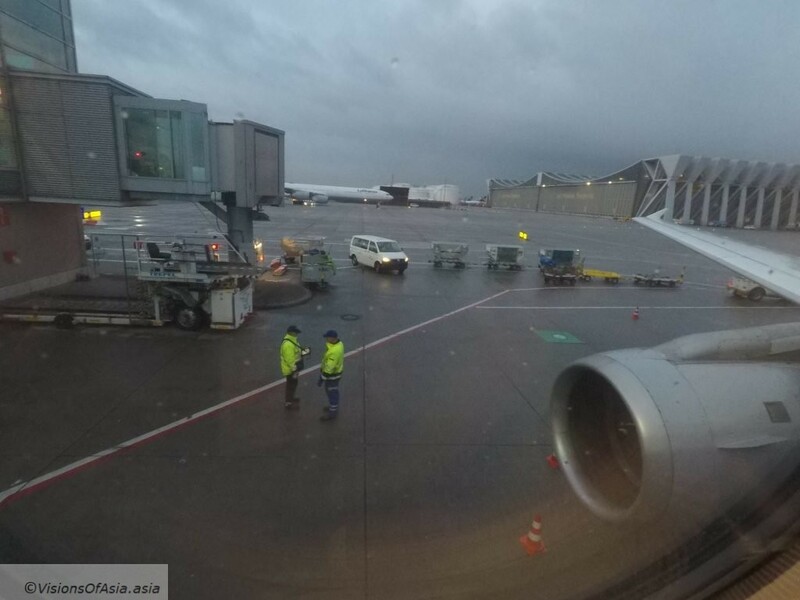 After shower, it was the time to catch my connecting flight to Nice. 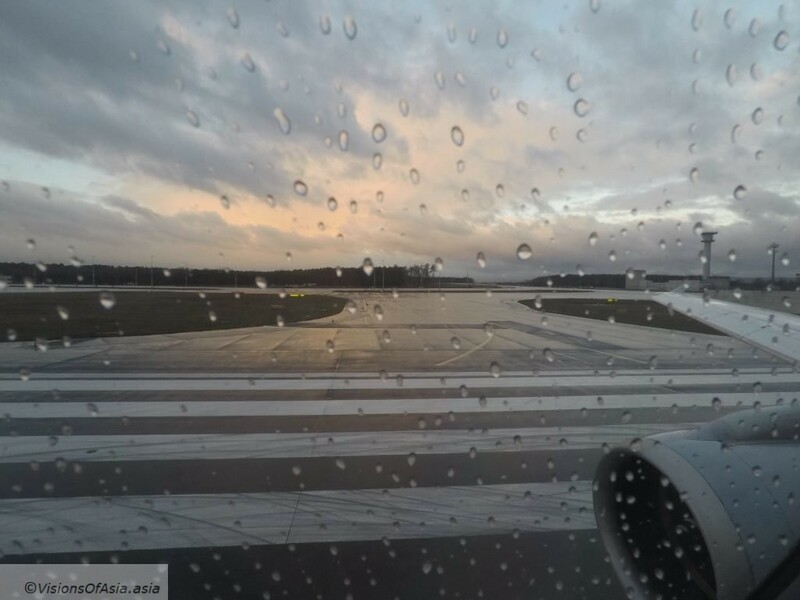 By that time, it had started raining and we took off in an Airbus A320 “neo”. Short plane, with winglets at the end of the wings, the A320 neo is the short range Airbus solution (something of a competitor to the B737 of Boeing). A view of the A320 neo at its gate. Notice the winglets at the end, fuel-saving feature. We took off in the rain, but not before seeing a streak of sunrise coming through the clouds. Sunrise while waiting to take off to Nice on the A320 neo. 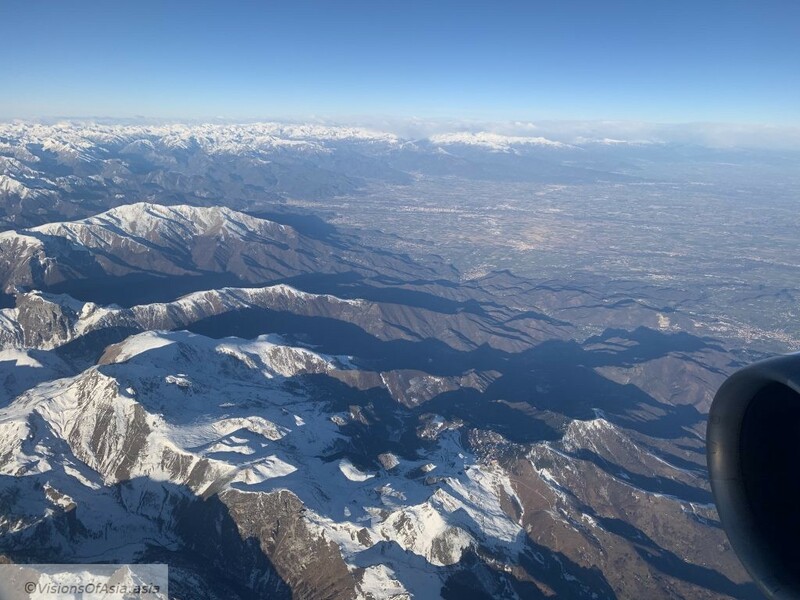 The flight was quiet and uneventful, but as the plane flies over the Italian alps in its approach to Nice, the views from the window were quite spectacular. A reminder of how beautiful it is to fly during day time. Obviously, I am not going to talk about my work here, nor what I did in Southern France in relation to business. 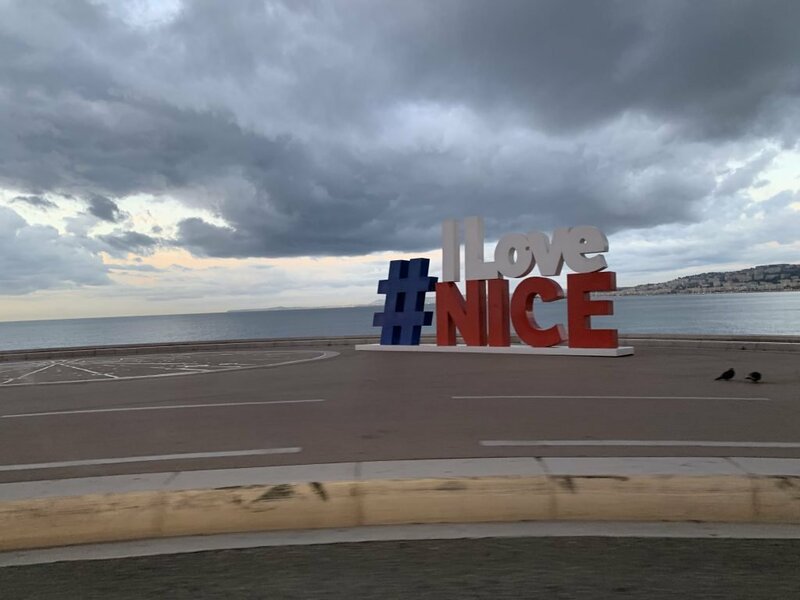 No, I instead wanted to talk a bit about the city of Nice: although slightly fresh, it was not yet the real cold and dreary days of December down south. I enjoyed a beautiful sun during my stay and, contrary to Asia, the skies were a magnificent blue. My hotel being located next to the Notre Dame Basilica, I managed to visit this beautiful neo-Gothic church – deserted as about every church in these days and times. 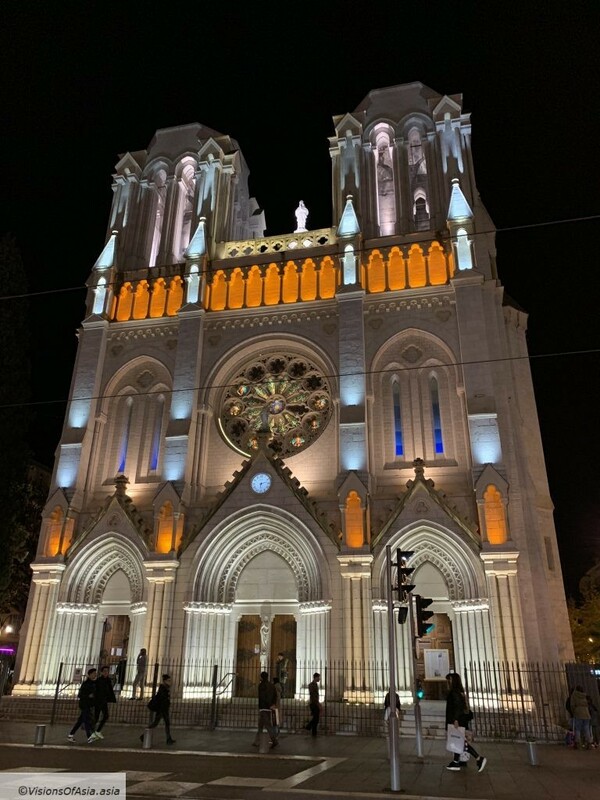 The beautiful Notre Dame de Nice Cathedral at night. The Basilica itself, is a magnificent example of Gothic architecture… brought down to scale! 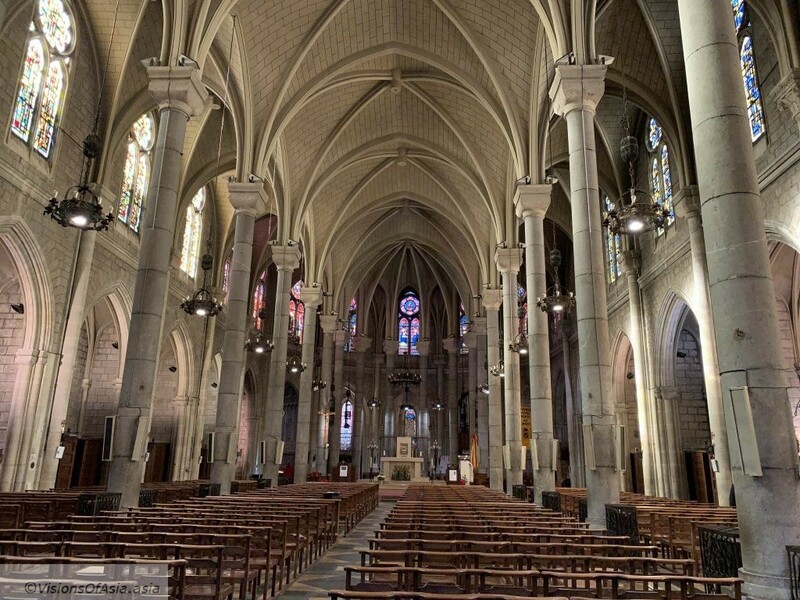 In fact, ths basilica was built around 1864, after the city of Nice was returned to France from the Kingdom of Sardinia. So, quite new as a church, but still it maintains a certain intemporal beauty. The whole area of the center of Nice is a bustling area of promenade and of animation of the Southern city. 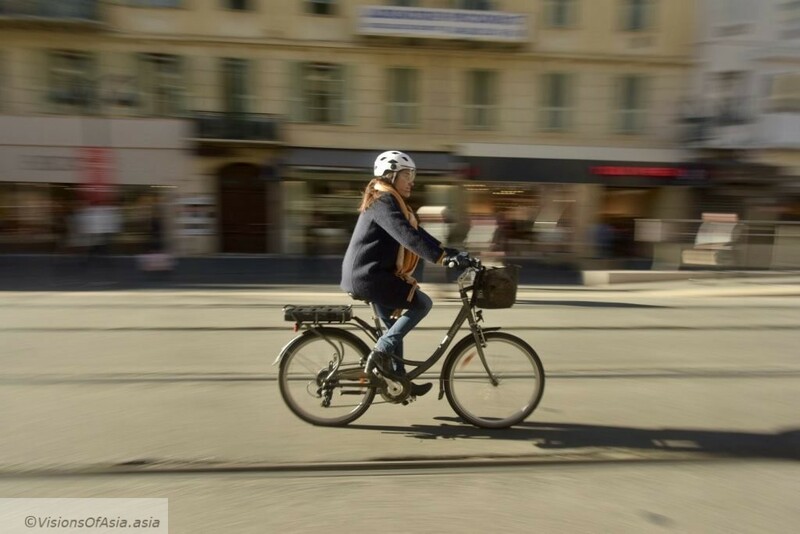 Cars are excluded from circulating, so the main transportation is the tram and bicycle. 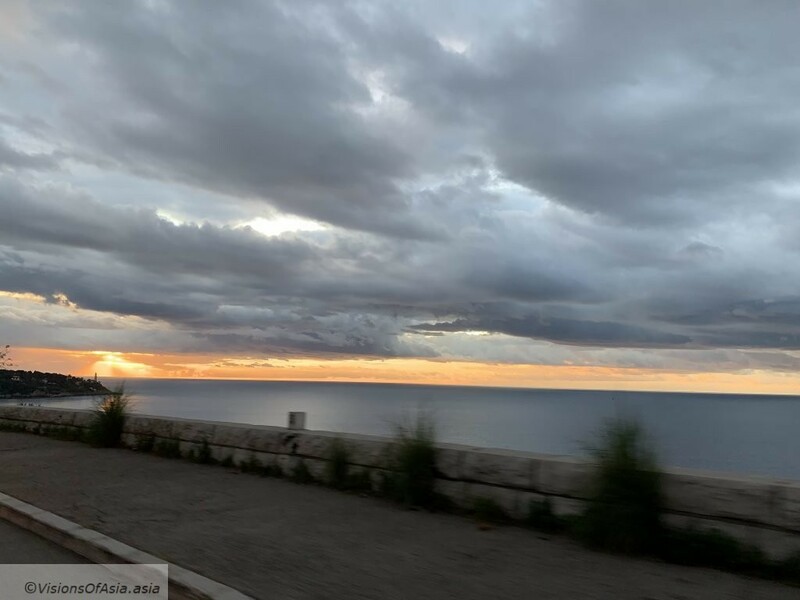 Sadly for a photographer, I was unable to stop and shoot a picture of the beautiful sunrise on the mediterranean coast near Nice. I did manage to grab a snapshot from my car’s window, though. A famous social media symbol for Nice. Later, on the same road, I managed to see a fiery sunrise. 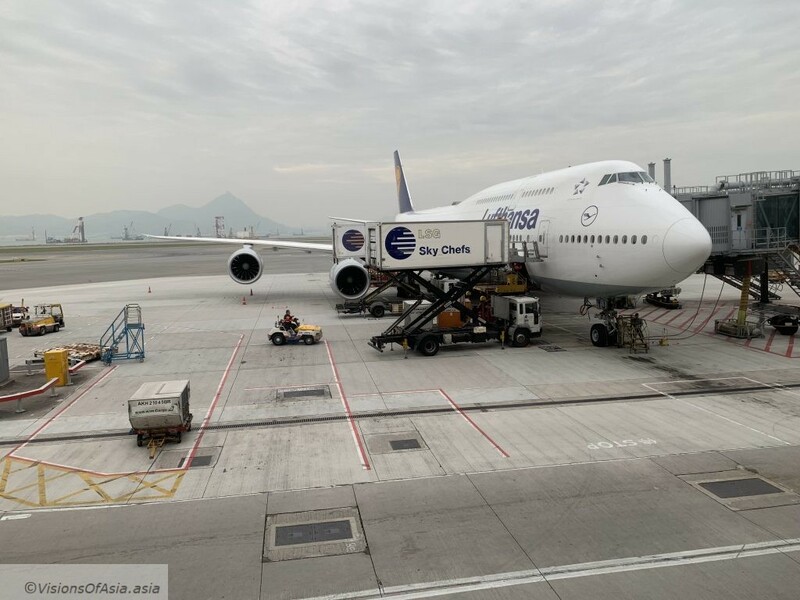 And when I arrived in Hong Kong, it was time to say goodbye to the 747 after two flights with Lufthansa. The Boeing 747-8 of Lufthansa at its gate in Hong Kong after the night flight from Europe.